Do you want Event Management Companies & Professionals to compete for your event? If you are looking forward to a well-managed & well-planned event for yourself & want to stay in your budget too, you have reached to the RIGHT place! 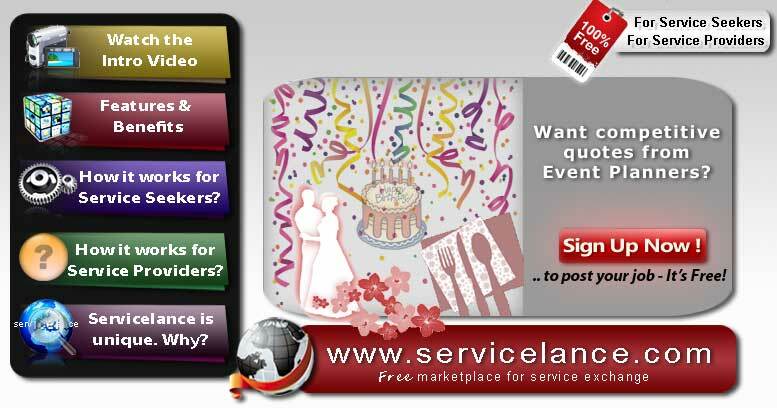 Describe your requirements by posting a Free job at Servicelance and start receiving Event management companies & professionals competitive quotes specifically tailored for your Event Requirements! SIMPLE, EASY & FREE! Search and contact Service Providers for free. Post your job requirements for free. Receive competitive quotes from both Businesses & Indivisuals. Close deals with providers as you prefer and pay them directly. Provide and Receive feedbacks on completed jobs. Are you an Event Planner looking for Event management jobs?